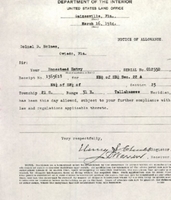 The homestead documentation for Colnel B. Holmes. Holmes' homestead was located in Oviedo, Florida. According to the documentation, Holmes was born in Marietta, Georgia, and grew potatoes and corn were on his homestead. Little else is known of this homesteader. “Homestead Documentation for Colnel B. Holmes.” RICHES of Central Florida accessed April 21, 2019, https://richesmi.cah.ucf.edu/omeka/items/show/5420.